Saint Gervais also known as Saint-Gervais-Les-Bains is a modest spa town with a delightfully authentic french alpine way of life. Situated in the Haute-Savoie region of the French Rhône-Alps it has a small tight-knit year round population. The natural thermal springs have been attracting visitors wanting to benefit from its hydrotherapeutic properties and claims to rejuvenate the body and soul for over 200 years since their discovery. Steeped in history, full of pride and with a healthy ambition to provide a warm welcome to all it’s visitors Saint Gervais is fail safe resort for your next summer holiday. It’s got everything going for it; Mont Blanc, a natural thermal spa, stunning scenery and a large well equipped resort, all at a very reasonable price. Yet it remains one of France’s best kept secrets, possibly due to the celebrity status of its nearest neighbours of Megeve and Chamonix. St Gervais (and Les Contamines) are simply unparalleled in the Mont Blanc region when it comes to a resort for the whole family. They have a strong family friendly ethos that is incorporated into all activities, events and facilities throughout the town. It was recently awarded 3rd place for the best family ski resorts in the world by the World Snow Awards and is no different in the summer months either. It’s thirst to showcase its talents has lead to St Gervais being the host to 19th stage of the world’s most famous cycle race, the Tour de France. Don’t be fooled into thinking St Gervais is just a winter resort, it has a lot (if not more) to offer in warm sunny months too. Summer activities include the obvious mountain hiking and trail running expected in the mountains and Mont Blanc region. Not only do you have the epic 100 plus mile Tour du Mont Blanc on your doorstep, immediate access to 180 km of local trails and the ability to easily link trails to nearby resorts creating almost endless possibilities for the avid explorer. Everything from a nature inspired family stroll to extremely technical multi-day treks are available you just have difficult decision of deciding which you are going to try. Some of our favourites include the Saint Gervais’ tallest peak of Mont Joly where you will find in our opinion the best postcard picture ‘pano’ of the Mont Blanc Massif plus the Fiz, and Arvais ranges. Keen hikers or those up for a challenge shouldn’t pass up the chance to walk the notorious roman road to visit the striking Lacs Jovet (2,174m) and its enticing double summits. If you prefer to hike lower on the valley then the Sentier du Val Montjoie is a beautiful and pleasant itinerary starting from stunning Parc Thermal following the Bon Nant River passing by authentic working farms as well as St Gervais itself on your way to Les Contamines. For those looking for a bit more culture on your walks why not take on the 20km Sentier du Baroque where you can explore the heritage and magnificent setting of Baroque architecture including a number of impressive churches. For more information on routes and itineraries click here. However, a bit like Britain St Gervais has got the cycling bug and has embraced all things cycling incorporating a keen cycling ethos, both on and off road! With fantastic and varied road cycling itineraries on offer which have had the TDF stamp of approval, you will not leave disappointed with the road quality, prestige and views you will gain from a road cycling holiday here. Those that prefer to hit the trails hard on the dirt are catered for also. St Gervais over the last couple of years have invested in development of a number of North Shore inspired downhill tracks that depart from the Le Bettex Gondola. Various trails differing in difficulty. The great thing about St Gervais is they continue to invest in the facilities and trail/ track maintenance each and every year. The mountain biking here may not be as developed as those found in nearby Morzine, but it will have no crowds so you will have a plentiful supply of open single track covering various terrain perfect for beginners or mixed ability groups. One advantage of St Gervais compared to say a resort like Chamonix is that these trails come without the imposed restrictions of which trails can and cannot be used offering you complete freedom on the mountains. 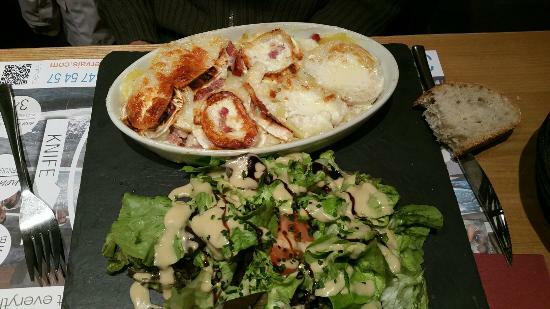 St Gervais is a specialist when it comes to a Savoyard cuisine. This modest spa town packs a punch with its culinary credentials even boasting a Michelin starred restaurant to its repertoire. One of the most alluring factors of St Gervais is how family orientated the resort is and this is no different when it comes to eating out. All restaurants are family friendly and healthy for the wallet too making it considerably cheaper than nearby resorts. In the summer months many of the town restaurants spill out into the centre square for rather idyllic alfresco dining. Café Rodolphe is a must when it comes to delicious lunches that hit the spot. It’s mainly Savoyard Fare on the menu with all the regional dishes catered for with sublime fondues, homely tartiflettes, and not bad crepes either! Le Royal is great for families and offers great value for money… the house burger is a particular favourite. Le Serac is definitely the place when celebrating a special occasion where your tastebuds will be tantalized by its sophisticated Michelin star accredited menu. Meat lovers should not leave St Gervais without having dined at Le Four, just a few minutes drive down the mountain towards Le Fayet. Le Four specialises in regional dishes but its claim to fame is definitely to do with its meat dishes cooked over a wood fire. The nightlife in St Gervais is a rather casual affair with a handful of bars dotted around town. The Brasserie du Mont Blanc has a modern sporting decour and is a popular spot for locals and tourist alike to enjoy a beer or cocktail and usually shows evening sports fixtures on the big screen. The Pur bar is a more typical bar where you will find an extensive cocktail menu and live music. Oboose cafe near the Le Bettex Gondola attracts a younger and sometimes alternative crowd with music playing well into the early hours. There’s always something interesting going on and lots to do in St Gervais, usually in the central village square. Here’s a small selection of what’s on offer in and around St gervais itself. Well we will start with the heavy hitters! At first St Gervais may seem like a peaceful mountain town but don’t judge a book by its cover. Not until you check our Bungee Mont Blanc, yes thats right you can bungee jump right from the centre of town. Bungee Mont Blanc give you the opportunity to throw yourself off the side of the viaduct bridge and straight into the beautiful gorge below! Those that wish to stay in the sky a little longer can take up the ever popular paragliding craze to hit the Alps. The birthplace of the sport as we know it today means that you have plenty of choice in terms of where you can take off from, how long for combined with some of the best scenery possible. The brand new swimming complex is a great way to entertain the whole family when in St Gervais. Facilities include both indoor and outdoor pool areas. If that’s not quite hitting the spot why not enjoy a quick game of tennis or a fun round of crazy golf behind the swimming pool. Not only must you check into the thermal spa Les Thermes whilst you are in St Gervais but also take a walk around its aesthetic grounds. The spa sits within the beautiful ‘Parc Thermal’ in the lower village of Le Fayet and is open all year round. On weekends children can take a ride on the mini railway whilst you have a tasty lunch or refreshing drink in the small cafe. Then is time to relax and recuperate in the warm indoor and outdoor hydrotherapeutic pools where various jets massage achy muscles whilst the healing waters rejuvenate. The Tramway du Mont-Blanc is the highest mountain railway in France and the fourth highest in Europe dating back to 1907. You can either depart from Le Fayet or St Gervais itself and take a ride as far as the Nid d’Aigle (translated as the Eagle’s Nest) taking in the spectacular views of Mont Blanc, Fiz and Arvais ranges on your travels. You will find yourself brushing shoulders with tourist and keen alpine climbers looking to summit Mont Blanc via the traditional route. From the Nid d’Aigle you can get an up close and personal view of the Bionnassay glacier, Domes de Miage and the infamous Goûter couloir and refuge. It is easy to hop on and off on the various stations en route. We would definitely recommend stretching the legs and going for a gentle stroll suitable for all the family on the Bellevue or Col de Voza plateau where you can also get a fantastic perspective of the entire Chamonix valley. Find out more including timetables and prices on the Compagnie du Mont Blanc Website. Getting to St Gervais is easy situated only an hour by road from Geneva and it’s international airport. Most of the journey will be on the fast paced Route Blanche before the gentle 250m (10 minute) climb up to Saint Gervais itself. Let Peak Transfer take all the stress out of your holiday this summer by taking advantage of our low cost, reliable private transfer service. Your very own dedicated driver will be ready to meet upon your arrival so all you need to do is put your feet up and relax. We also provide shared transfers to nearby Saint-Gervais-Le-Fayet station (subject to availability). For more information contact us directly or complete a quick quote here.